There’s no reason that pizza can’t be part of a healthy diet…..the secret is in the toppings! Place pizza stone, large tile, or flat, cast-iron griddle in oven and preheat oven to 450 degrees. Heat large skillet over medium flame and add pancetta. Cook for 5 minutes, stirring to coat pan with grease. Add garlic and shredded sprouts. Sauté for about ten minutes, or until bacon is cooked and sprouts are wilted. Remove from heat and set aside. Sprinkle cornmeal on rimless baking sheet or pizza peel. Scatter flour on large cutting board and over rolling pin. Roll pizza dough out and place on top of the cornmeal on the baking sheet. 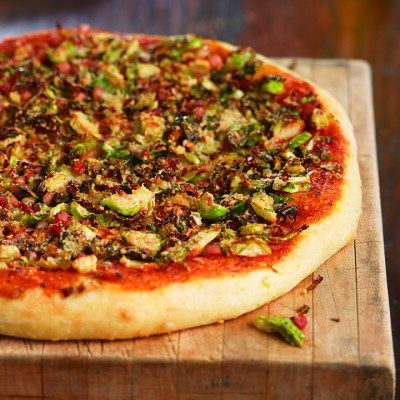 Spread dough with sauce, add sautéed sprouts and top with Parmesan cheese and red pepper flakes. Slide pizza onto stone in oven and bake until toppings are bubbly and crust is golden brown, about 15 minutes. Cool slightly before cutting into wedges.